Railway Minister Pawan Kumar Bansal on Thursday favoured rail-based container movement between India and Pakistan to reduce transaction cost and ease road traffic. "Trade facilitation measure such as development of integrated check posts will give a boost to bilateral trade between India and Pakistan through land route. One other step to give further fillip to bilateral trade could be introduction of containerisation," Bansal said in a conference. He suggested that normalisation of trade flows between the countries would be the best way forward. "Going forward, engaging with each other is the only way out for both countries and they need to find peaceful and productive ways of doing so and this one of the best ways forward would be normalisation of trade flows between India and Pakistan. "Bilateral trade relations are now at a point where significant economic gains could serve as powerful means for conflict resolution," he said. Coming back to railway, he said the national transporter has an important role to play to boost trade between the both countries. 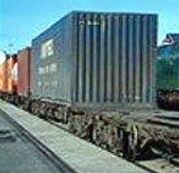 "Rail-based movement of containers across the boundary will not only ease road traffic, but also help trade in offering door-to-door service to its customers, which would also help in cutting down the transaction cost," he stressed. "Presently there are two points where rail link is established - Attari and Munnabao. There is potential of starting the containerisation movement. We can negotiate to take forward the containerisation. "We can also work together to develop technology solutions in railway sector for our common needs," Bansal said, adding "as a long term strategy for developing our economies, both India and Pakistan have agreed to be part of UN project of Trans-Asia Railway Network." Elaborating on the potential of trading opportunities between the two countries, Bansal said, "As India and Pakistan move towards normalising their bilateral trading regimes, there will be new trading opportunities for both countries. "There is a large untapped trade potential between the two countries and various estimates suggest that potential trade could vary between .5 to 20 times of actual trade," he said. Consequent to the trade liberalisation measures, bilateral trade between the two countries increased from $.6 billion in 2004-05 to $1.9 billion in 2011-12. Between 2010-2012, Pakistan's exports to India rose by 27 per cent from $ 333 million to $ 422 million. Pakistan's exports to India during April 2012 to January 2013 registered a 50 per cent increase over the same period in previous year to $475 million from $320 million. The items imported from Pakistan include dates, cement, woven cotton fabrics, petroleum, organic chemicals and plastics. According to industry, there are large scale trade possibilities between India and Pakistan in several sectors such as agriculture and processed food items, petroleum products, chemicals, automobiles, processed foods and textiles. Bansal said there are also possibilities in the services sector, information technology, healthcare and audio-visual sector. "For deeper and stronger trade linkages, it is important that there are foreign investment flows between the two countries. India now welcomes foreign investment from Pakistan and Indian industry would be glad to invest in Pakistan," he said. Bansal also noted that the prevailing liberal visa regime has made cross-border travel simpler. "However", he said, "Several impediments remain to be addressed. A concerned effort needs to be made to create multi-level channels of communication which would bridge the information gap and generate a significant change in the business environment of the two countries. Describing trade as an "engine of growth", he said it is vital for bringing about economic prosperity and development needed to eradicate poverty. He said significant ground has been covered on many trade issues. "Between 2004 and 2007, the talks resulted in three major changes - an expansion of Pakistan's positive list of items allowed to be imported from India, opening of the road route for the first time in 2005 and an amendment of the maritime protocol which allowed trade by the sea route according to global maritime norms." In April 2011, Indo-Pak talks culminated in Pakistan's decision to grant MFN status to India, paving the way for a new era in India Pakistan trade relations. "Both countries had realised that the mutual trust deficit was a major area of concern and the initiation of the process of finding cooperative solutions to all problems faced has created a new climate of positivity and progress," he said. Post Budget, minister announces 19 MORE NEW trains!